For a list, see List of Prime Ministers of Spain. For the Head of State during Second Spanish Republic, see President of the Republic (Spain). General elections to the Congress of Deputies are held every 4 years at most. No term limits are imposed on the office. The Prime Minister of Spain, officially the President of the Government of Spain (Spanish: Presidente del Gobierno de España), is the head of the government of Spain. The office was established in its current form by the Constitution of 1978 and originated in 1823 as a chairmanship of the extant Council of Ministers. Upon a vacancy, the Spanish monarch nominates a presidency candidate for a vote of confidence by the Congress of Deputies of Spain, the lower house of the Cortes Generales (parliament). The process is a parliamentarian investiture by which the head of government is indirectly elected by the elected Congress of Deputies. In practice, the Prime Minister is almost always the leader of the largest party in the Congress. Since current constitutional practice in Spain calls for the King to act on the advice of his ministers, the Prime Minister is the country's de facto chief executive. Pedro Sánchez of the Spanish Socialist Workers' Party (PSOE) has been Prime Minister since 2 June, 2018, after a successful motion of no confidence against former Prime Minister Mariano Rajoy. 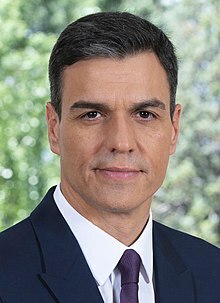 The Spanish head of government has, since 1938, been known in Spanish as the Presidente del Gobierno – literally President of the Government but commonly translated outside of Spain as "Prime Minister", the usual term for the head of government in a parliamentary system. This distinction sometimes causes confusion among English-speakers; both President George W. Bush and his brother, Florida Governor Jeb Bush, referred to José María Aznar as "President" on separate occasions, and Donald Trump referred to Mariano Rajoy both as "President" and "Mr. President" during Rajoy's 2017 White House visit. The custom to name the head of government as "President" dates back to the reign of Isabella II of Spain, specifically during the regency of Maria Christina of the Two Sicilies, when the official title was Presidente del Consejo de Ministros ("President of the Council of Ministers"), which remained until 1939, when the Second Spanish Republic ended. Before 1834 the figure was known as Secretario de Estado ("Secretary of State"), a denomination used today for junior ministers. On 19 November, 1823, after a brief liberal democratic period called the Liberal Triennium between 1820 and 1823, King Ferdinand VII re-established the absolute monarchy and created the Council of Ministers that continues to exist today. This Council was chaired by the Secretary of State, who acted as Prime Minister. The Spanish Royal Statute of 1834 replaced the chair with a President of the Council of Ministers invested with executive powers. During the nineteenth century, the position changed names frequently. After the Glorious Revolution of 1868, it was renamed President of the Provisional Revolutionary Joint and later President of the Provisional Government. In 1869, the office resumed the name of President of the Council of Ministers. Following the abdication of King Amadeus I, during the First Republic the office was the President of the Executive Power and was head of state. In 1874, the office name reverted to President of the Council of Ministers. Since its inception, the Prime Minister has been appointed and dismissed by the will of the monarch. Successive constitutions have confirmed this royal prerogative of the monarch in the Constitution of 1837 (article 47), article 46 of the Constitution of 1845, the Constitution of 1869 (article 68), and the Constitution of 1876 (article 54). With the fall of the republic and the restoration of the Bourbon Dynasty on King Alfonso XII, the office maintained its original name until the dictatorship of Primo de Rivera, when it was renamed to President of the Military Directory. In 1925, the original name was restored again. During the Second Republic the title was the same but when the Civil War started, on the side of the rebellion the head of government was called Chief of the Government of the State and since January 1938 the office acquired the current name, President of the Government, but between that date and 1973 the office was held by the dictator. The Republican Constitution of 1931 provided for the Prime Minister and the rest of the government to be appointed and dismissed by the President of the Republic but they were responsible before the Parliament and the Parliament could vote to dismiss the Prime Minister or a minister even against the will of the President of the Republic. In 1973, the dictator separated the Head of the State from the Head of the Government and that division exists today, being the Prime Minister democratically elected by a Parliament elected by universal suffrage, free and equal. Once a general election has been announced by the king, political parties designate their candidates to stand for Prime Minister —usually the party leader. A Prime Minister is dismissed from office the day after the election, but remains in office as a caretaker until his/her successor is sworn in. Following every general election to the Cortes Generales (Cortes), and other circumstances provided for in the constitution, the king meets with and interviews the leaders of the parties represented in the Congress of Deputies, and then consults with the Speaker of the Congress of Deputies (officially, Presidente de Congreso de los Diputados de España, who, in this instance, represents the whole of the Cortes Generales and was himself elected from within the Congress to be the Speaker) before nominating a candidate for the presidency. This process is spelled out in Section 99 of Title IV. Often minor parties form part of a larger major party, and through that membership it can be said that the king fulfills his constitutional mandate of consulting with party representatives with Congressional representation. Under the Spanish Constitution of 1978, the Prime Minister and the cabinet are responsible to the Congress of Deputies. Due to the need for the Prime Minister to command the confidence of the Congress, the monarch must nominate a candidate for the office after consulting the political groups with parliamentary representation. For this reason, the Prime Minister is usually the leader of the largest party in the Congress. For the Crown to nominate the political leader whose party controls the Congress can be seen as a royal endorsement of the democratic process— a fundamental concept enshrined in the 1978 Constitution. By political custom established by Juan Carlos I since the ratification of the 1978 Constitution, the king's nominees have all been from parties who maintain a plurality of seats in the Congress. However, there is no legal requirement for this. In theory, the largest party could end up not ruling if rival parties gather into a majority, forming a coalition—though this has never happened at the national level. As political activity in Spain has effectively coalesced into a two-party system between the Spanish Socialist Workers' Party and the People's Party, the two major parties usually adopt some aspects of the minor party platforms in an effort to attract them into parliamentary pacts to edge out their rival party in the event that no party is able to command an absolute majority of the Congress by themselves. The monarch is normally able to announce his nominee on the day following a general election. The monarch's order nominating a Prime Ministerial candidate is countersigned by the Speaker of the Congress, who then presents the nominee before the Congress of Deputies in a process known as a Congressional Investiture (Investidura parlamentaria). During the Investiture proceedings the nominee presents his political agenda in an Investiture Speech to be debated and submitted for a Vote of Confidence (Cuestión de confianza) by the Congress, effecting an indirect election of the head of government. A simple majority confirms the nominee and his program. At the moment of the vote, the confidence is awarded if the candidate receives a majority of votes in the first poll (currently 176 out of 350 MPs), but if the confidence is not awarded, a second vote is scheduled two days later in which a simple majority of votes cast (i.e., more "yes" than "no" votes) is required. Juro/Prometo, por mi conciencia y honor, cumplir fielmente las obligaciones del cargo de Presidente del Gobierno con lealtad al Rey, guardar y hacer guardar la Constitución como norma fundamental del Estado, así como mantener el secreto de las deliberaciones del Consejo de Ministros. I swear/promise, under my conscience and honor, to faithfully execute the duties of the office of Prime Minister with loyalty to the King, obey and enforce the Constitution as the main law of the State, and preserve in secret the deliberations of the Council of Ministers. In 2008, from the time the king nominated José Luis Rodríguez Zapatero for a second term as Prime Minister immediately following the 2008 general election, almost a month passed before Zapatero was able to present his Investiture Speech before the Congress and stand for a Vote of Confidence. If no overall majority was obtained on the first Vote of the Confidence, then the same nominee and program is resubmitted for a second vote within forty-eight hours. Following the second vote, if confidence by the Congress is still not reached, then the monarch again meets with political leaders and the Speaker, and submits a new nominee for a vote of confidence. If, within two months, no candidate has won the confidence of the Congress then the King dissolves the Cortes and calls for a new general election. The King's royal decree is countersigned by the Speaker of the Congress. Once appointed, the Prime Minister forms his government whose ministers are appointed and removed by the King on the Prime Minister's advice. In the political life of Spain, the king would already be familiar with the various political leaders in a professional capacity, and perhaps less formally in a more social capacity, facilitating their meeting following a general election. Conversely, nominating the party leader whose party maintains a plurality and who are already familiar with their party manifesto facilitates a smoother nomination process. In the event of coalitions, the political leaders would customarily have met beforehand to hammer out a coalition agreement before their meeting with the King. Government and the Cortes sit for a term no longer than four years when the Prime Minister tenders his resignation to the king and advises the king to dissolve the Cortes, prompting a general election. It remains within the king's prerogative to dissolve the Cortes if, at the conclusion of the four years, the Prime Minister has not asked for its dissolution, according to Title II Section 56. The king may call for earlier elections on the advice of the Prime Minister, known as a snap election, but no sooner than a year after the prior general election. Additionally, if the Government loses the confidence of the Cortes, then it must resign. In the event that a Prime Minister resigns without advising the monarch to call for new elections, dies or becomes incapacitated while in office, then the government as a whole resigns and the process of royal nomination and appointment takes place. The deputy Prime Minister, or in the absence of such office the first minister by precedence, would then take over the day-to-day operations in the meantime as acting-prime minister, even while the deputy Prime Minister themselves may be nominated by the King and stand for a vote of confidence. The Prime Minister's position is strengthened by constitutional limits on the Congress' right to withdraw confidence from the government. Following the German model, a Prime Minister can only be removed by a constructive vote of no confidence. While the Congress can censure the government at any time, the censure motion must also include the name of a prospective replacement for the incumbent Prime Minister. If the censure motion is successful, the replacement candidate is automatically deemed to have the confidence of the Congress, and the monarch is required to appoint him as the new Prime Minister. Title IV of the Constitution defines the government and its responsibilities. The government consists of the President of the Government and ministers of state. The government conducts domestic and foreign policy, civil and military administration, and the defense of the nation all in the name of the king on behalf of the people. Additionally, the government exercises executive authority and statutory regulations. There is no provision in the Spanish Constitution for explicitly granting any emergency powers to the government, which could be understood as exorcising the ghost of the recent dictatorship in Spain. However, Title II, Sections 56 of the constitution vests the monarch as the "arbitrator and moderator of the institutions" of government, [The King] arbitrates and moderates the regular functioning of the institutions (arbitra y modera el funcionamiento regular de las instituciones). This provision could be understood as allowing the king or his government ministers to exercise emergency authority in times of national crisis, such as when the king used his authority to back the government of the day and call for the military to abandon the 23-F coup attempt in 1981. Adolfo Suárez was the first democratically elected Prime Minister of the post-Franco government, the 149th Spanish Prime Minister since 1834. He was appointed by King Juan Carlos on 3 July, 1976. In the Spanish general election, 1977 his position as Prime Minister was confirmed by a vote. Peerages in Spain are created by the Grace of the King, according to the Spanish Ministry of Justice, and are the highest marks of distinction that he may bestow in his capacity as the fons honorum in Spain. Conventionally, the Title of Concession creating the dignity must be countersigned by a government minister. When a title is created for a former president, the succeeding president customarily countersigns the royal decree. As a reward for national service, the king awarded peerages to two of his former presidents who have since retired from active politics: Adolfo Suárez was created 1st Duke of Suárez; and Leopoldo Calvo-Sotelo was created 1st Marquis de la Ría de Ribadeo [es]. Additional titles of nobility have been created by the king for other government ministers, usually at the advice of the president of the government. As of 2005, the king has created forty hereditary titles of nobility. The most recent Prime Minister to die was Adolfo Suárez (served 1976–1981) on 23 March 2014, aged 81. ^ "Relación cronológica de los presidentes del Consejo de Ministros y del Gobierno". ^ EFE (2019-01-14). "Pedro Sánchez percibirá un salario de 82.978 euros". El País (in Spanish). ISSN 1134-6582. Retrieved 2019-02-09. ^ Secretary of State for Communications of the Ministry of the Presidency. "President of the Government". Ministry of the Presidency of Spain. Retrieved 16 July 2011. ^ "Joint Press Conference with President George W. Bush and President Jose Maria Aznar" The White House. Retrieved 2 October 2013. ^ "Jeb Bush agradece el apoyo "del presidente de la República española"" [Jeb Bush thanks the "President of the Spanish Republic" for his support]. El País (in Spanish). 18 February 2003. Retrieved 14 July 2016. ^ "Trump repeatedly called the prime minister of Spain 'president,' and everyone is confused". Mashable. 2017-09-26. Retrieved 2017-10-10. ^ "Constitución española de 1837 - Wikisource". es.wikisource.org (in Spanish). Retrieved 2018-10-05. ^ "Constitution of the Spanish Monarchy of 1845" (PDF) (in Spanish). 1845. ^ "Constitution of the Spanish Monarchy of 1869" (PDF) (in Spanish). 1869. ^ "Constitution of the Spanish Monarchy of 1876" (in Spanish). 1876. ^ "Constitución española de 1931 - Wikisource". es.wikisource.org (in Spanish). Retrieved 2018-10-05. ^ Title II Section 56 the monarch is the "arbitrator and moderator of the regular functioning of the institutions", "arbitra y modera el funcionamiento regular de las instituciones"